There’s only one month to go until the way vehicle tax is calculated will change. 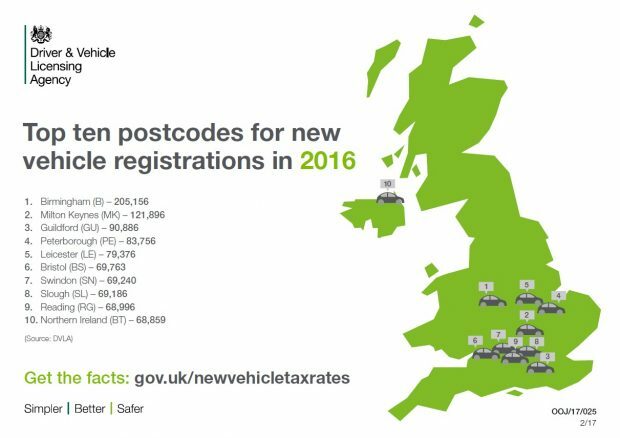 As the changes will only affect new cars and some motorhomes, we thought we’d have a look to see which areas registered the highest number of new vehicles last year. The Birmingham postcode area was busiest buying new vehicles, with over 200,000 being registered. Birmingham was followed by Milton Keynes and Guildford. It’s no great surprise that postcodes in densely populated areas made the top 10, but it’s interesting that Glasgow (67,780), Manchester (32,177) and Liverpool (26,756) were just outside. developing a new service to register new vehicles which will launch later this year. The changes take effect from 1 April 2017, so make sure you have a look at the new vehicle tax rates to see if they affect you. Hello, what are the plans for used vehicles tax brackets and subsequent costs per year ? Will used vehicles also fall into the same brackets and cost as new in the future? If so, do you know when ? I am covering approx 3,000 miles per annum. I am looking at changing my personal vehicle this year. Do I buy a petrol turbo car e.g. Toyota Auris? Or a diesel 1.6 diesel Auris? I have test driven a hybrid with 82 g/km co2. Any vehicle first registered before the 1 April 2017 will continue to be taxed under the current vehicle tax scheme i.e. based on CO2 emissions. Like all duties the Chancellor keeps vehicle tax under review each year. Should the vehicle be sold, it would continue to fall under the scheme which was in place at first registration. DVLA are not able to advise on which vehicle to purchase. Robbery. Considering the poor and pot-holed state of the roads! Time to introduce a "pay as you go" system where only the time/mileage spent on the roads is paid for!! From 2020-21 the Government will spend all of the revenue raised from Vehicle Excise Duty (VED) in England on the English Strategic Road Network. Introducing a VED regime based on the number of miles driven would be complex and expensive to set up and administer. Introducing such a scheme would be contrary to the Government’s wider aim of a tax system that is simple to understand and easy to comply with. As the changes are driven by emissions and air quality in addition to tax revenue income have the DVLA yet separated the emissions category (stage 4,5 etc) from the vehicle description fields so that appropriate metrics of how many old emission level vehicles (especially Heavy Goods) are still driving on the roads so that future incentives can be developed to remove these polluting vehicles from our UK infrastructure? We are currently working with Department for Transport to consider data capture going forward, including the capture of Euro status. If the Government were seriously trying to reduce pollution and encourage use of public transport they would increase the cost of fuel to subsidise it and do away with VED. Why should my family pay per person to use expensive public transport when I have already paid VED to use my car and the cost is the same whether I travel alone or with 4 passengers?